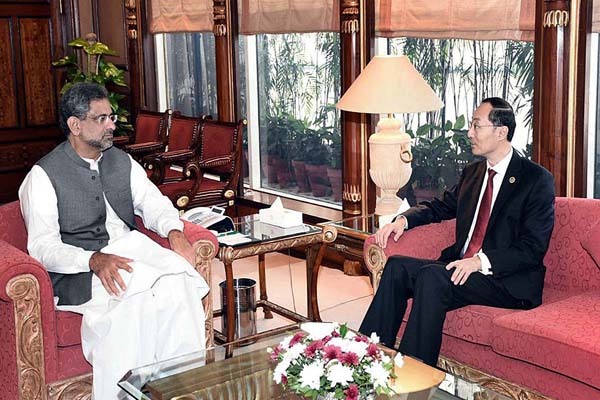 ISLAMABAD, Oct 6 (APP): Prime Minister Shahid Khaqan Abbasi Friday lauded the services of the outgoing Chinese Ambassador to Pakistan Sun Weidong for further strengthening and deepening the strong bonds of friendship and multi-sector cooperation between Pakistan and China. Talking to the ambassador who made a farewell call on the here at Prime Minister Office, the Prime Minister commended his services for facilitating smooth and expeditious execution of the CPEC projects. collaboration in various areas, ranging from trade and commerce to education and culture. outstanding performance of the Ambassador. Jiqing in creating better understanding and affinity between the people of Pakistan and China. The Prime Minister wished the outgoing Ambassador the very best in his future personal and professional life. Ambassador Sun Weidong thanked the Prime Minister and the Government of Pakistan for extending cooperation in the performance of his diplomatic duties and said it was a privilege for him to serve in Pakistan, and to play his part in further strengthening the time-honoured friendship between the two nations.